The Max2Play Image for Raspberry Pi offers preinstalled audio players that can easily be controlled and configured through the web interface. We currently have three different players implemented: Squeezelite (Software Squeezebox), Shairport (AirPlay) and MPD. The players differ in their complexity and their applications. 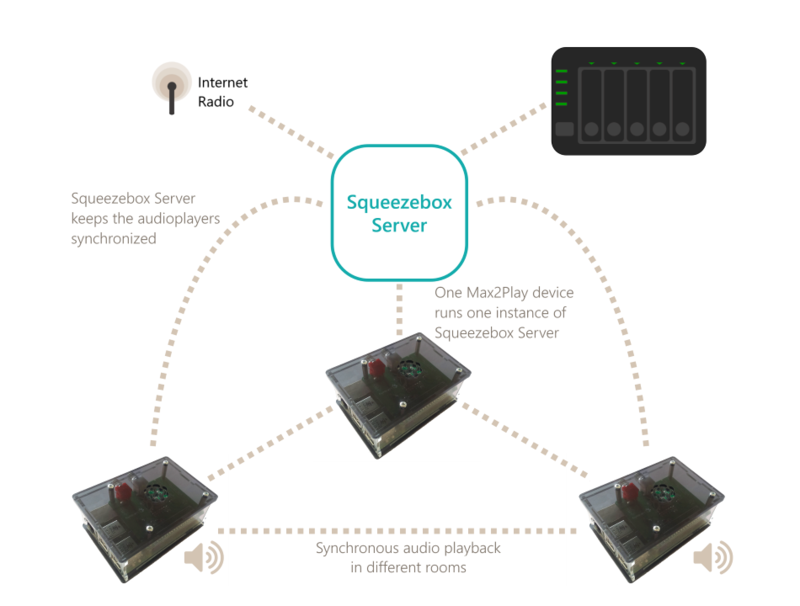 For a Multiroom setup, we recommend the use of Squeezelite in combination with the Squeezebox Server. Shairport offers easy playback from Apple devices or iTunes. To compile the appropriate hardware (Raspberry PI and matching sound card) for the right purpose, we recommend our multiroom audio configurator. How to use the different Max2Play Bundles, you can see in this example of application for a multiroom audio setup. Many plugins for Spotify, playlists, etc. For Squeezelite, a running Squeezebox Server in the local network is necessary. This is easily done with Max2Play. 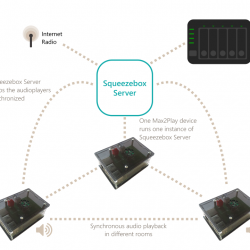 Multiple Max2Play devices (Raspberry Pi’s, ODROID’s) or Squeezeboxes can be synchronized in the network. 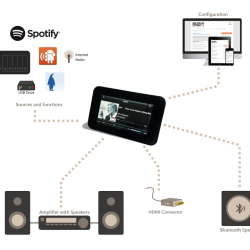 With Shairport, all music can be streamed directly to the Raspberry Pi 2 or the ODROID. Main Applications: easy audio player solution to stream music from iTunes or Apple devices onto the Max2Play device. With the Max2Play extension, the administration and control of the MPD player is facilitated: installing a music drive, a playlist directory (easy mounting with Max2Play extension) as well as special options for a connected sound card. Main Applications: simple audio player solution for playback of internet radio or local music. In addition to the easy installation and administration of audio players, Max2Play also offers simple and fast integration of sound cards. All HiFiBerry, IQaudIO and JustBoom sound cards can be directly activated in the special Max2Play Images for HiFiBerry, IQaudIO and JustBoom. For all other cards, the activation can be set in the extension „Raspberry Settings“. For all these sound cards, the optimal hardware settings are preset (clock frequency, voltage, video memory). Max2Play also supports USB sound cards: These can be used (if the HDMI output is occupied) to enhance the audio output. Additionally, Max2Play offers an equalizer function on the web frontend and other filters for audiophile uses. No, the shairtunes plugin does not work when the Shairport player is running in the background or is on autostart. Raspberry Settings is not required for shairtunes to work, it is required for sound cards like the IQ audio to work properly. First let me say: M2P rocks!!! Is this documented anywhere? is this specific to this config (Amp+)? AND: is there any chance for this to be enhance in the future ? Thanks for the kind words. I try to mention it as much as possible in my videos but you have a point that this information should be more prominent. The issue is a general one and not specific to your setup. We will consider including it in the next update. tried one more time by reinstalling everything. Rpi B + IQAudio. Everything works beautifully but I still can not get any shairtune devices available in my network. My Apple TV and Airport express are shown and working. I use LAN connection to my Rpi. I have an Asus RT-N56U as router after my cable modem. If it was just the WLAN with iPad Air or iPad mini or iPad 2 (all with ios 8.X) we have in our household but also iMac iTunes only shows Airport express and Apple TV as alternatives. Also Apple TV shows only Airport Express as option for speakers. Wen you say „Settings is not required for shairtunes to work, it is required for sound cards like the IQ audio to work properly.“ What do you, Heiner, mean? My IQ Audio is working great without any settings plugin. I do not have Shairport started and I have installed Shairtunes2 and checked in server settings that the plugin is seleced there. Is there a way of checking whether shairtunes plugin is doing anything or not? Regarding the settings, you need a premium license to install and use the extension „Raspberry Settings“ with which you can select sound cards and optimize the performance of the card and Raspberry. Regarding your problem, the first question would be whether you ticked off the autostart box for shairport, because otherwise shairport restarts constantly and interrupts the system. Otherwise I would recommend testing shairport seperately with Squeezelite not running to see if the Airplay functionality itself in your system works. If that is the case, I would recommend trying to deinstall the Squeezebox Server and installing the another version with which you can try the Shairtunes plugin again. If you are still not getting results, please send us the debug info so we can narrow down the problem more easily. Shairport does not show any airplay devices either, with no squeezelite running. Where can I get the debug info? The Debug Info is at the end of the page of each tab in the web interface. Please copy and paste it either into a forum post in our forum or via email so we can take a look. How can I make audioplayer (squeezelite/logitech media player) continue to play the playlist when the Pi is powered up without having to connect via the web interface. I just want the Pi to play music when I switch it on without any other intervention. Keep up the good work – M2P is excellent . You can add commands to the boot sequence to apply this request. # Before exit put in 0 ! I still have not succeeded in getting airplay to work. Now I was wondering if there is any way of playing browser-based music sources, Naxos music library in particular with a max2play-setup? I cannot get the graphic equalizer to work. I have chosen the USB soundcard as the audio device which is a Xonar U7. When I choose the equalizer as the audio device then there is no sound output from the Xonar. Do I have to add some more settings in squeezelite to get the audio stream to pass through the equaliser before being sent to the Xonar. Please try to tick the option „Use USB-DAC“ in the Audio Player menu. That might get the equalizer to work. However, we cannot guarantee compatibility with our equalizer with every USB sound card. Unfortunately, we have no experience with the Xonar U7. I had shairtunes2 working for- two days. I do not know what had changed and what made it disappear again…. I’d ike to try your solution to build a headless music client with Squeezelite on my rasp pi. I have only one question: after a proper installation and configuration, can I run M2P with memory card in read only mode? if yes, I can stop my rasp pi without a proper shutdown without any risks removing the wall plug. I know, this is not the best way to do it but it could be easier. Squeezelite and now with the newest version also Jivelite can run in the read-only mode without problems. However, you cannot run the Squeezebox Server on a device with the read-only mode enabled. thank you for your comment and positive feedback about the new features of Max2Play. The Equalizer can be used by choosing „plugequal“ in the Advanced Options of Squeezeliteplayer (Audioplayer menu). Afterwards, tick the „Use Equalizer“ checkbox, choose the EQ settings you want and uncheck the box again, if you want to improve the loading time of the audioplayer tab. By the way, using this equalizer leads to a decreased resolution of your audio signal and, accordingly, to a worse quality of audio playback. Do you have more details or an example of how this works with Spotify, and is it possible to play Spotify to multiple players simultaneously (from the Server I presume)? Thanks. The Spotify-functionality comes from the third-party-plugin on the Squeezebox Server, triode’s Spotify plugin. You can find more info on its capabilities around the net. 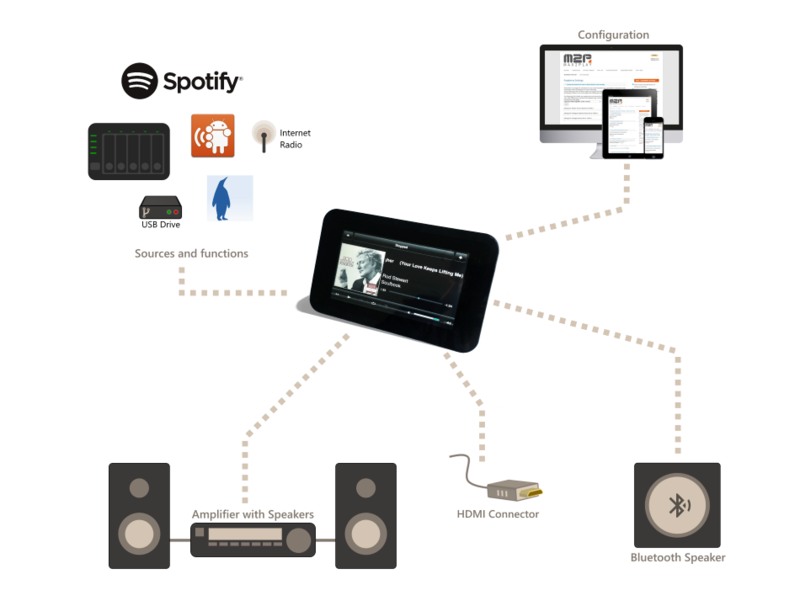 It supports one stream from Spotify at a time which can be synchronized and played simultaneously on mutliple devices. Is there a ‚compromise‘ ? I got somethink wrong, sorry. I edited my comment above. Does it work for you? Can I use Max2play to setup the following: a Raspberry pi 2 running Pandora streaming over wifi to Google Chromecast Audio? I want to use a touchscreen and create so wife can listen to audio throughout house. Pandora should work on the Squeezebox Server-plugin for Max2Play. Google Chromecast Audio, however, could be a problem. We have no experience with this hardware yet and do not know if it supports the Squeezebox-System-Software which would be required to make the Chromecast a player. We would recommend either using another Raspberry Pi 2 or the same Pi as a player. All you need is an instance of Squeezelite to receive the audio from the Server. You can try out how well Pandora works with the SBS on our free Image. Both player and server come preinstalled. Will M2P work in the RPI3 receiving Audio via squeezlite and playing via Bluetooth? If you mean using a Bluetooth speaker as output for a Squeezelite player, then yes. MAX2PLAY is a very good program. I salute your accomplishments in make such a quality product. Could you please make a newer Image download for HiFiBerry users? I have been using the DAC+ board through my R-Pi2B+ for over a year. This past week I got a HiFiBerry DAC+ PRO and was not successful using the image download. The LED on the card never came on and audio never came out. Re-installed DAC+ and all is back to normal again. Do you think a newer image with the latest Rasberry Pi and HiFiBerry drivers might help? The integration of the HiFiBerry sound cards should not be an issue. Could you not select the DAC+ PRO in the Raspberry Settings? I have a Pi with Max2Play installed. Squeezelite works well and outputs to my Hifiberry Digi well. However, Airplay/Shareport doesn’t output at all. iTunes connects well with an Airport Express and also with a Neet Airstream. It also works with Retune for control on Android. So I don’t think iTunes is the issue. Since the Pi/Hifiberry also work perfectly with Squeezelite, I don’t think the cables or hardware can be the issue. The only other clue I have for you is that when I send music to the Pi via Shareport, the digitial receiver locks on to a SP/DIF signal … but it is silent. Try the same thing via Squeezelite – all works. I don’t want to use Squeezeserver anymore and am using iTunes for Airplay and multiroom. Hence I’d like this to work. Please post your problems in our forums so the whole community can benefit and contribute to the exchange. Have you set the same output for both Squeezelite and Shairport? If so, please make sure to deactivate Squeezelite when using Shairport and vice versa. Apologies. Will use forums next time. Simple fix. Turn off PI and Mac/iTunes, reboot, all works! I’ve used m2p for my rpi2 and cirrus/wolfson. I would use mpd with cirrus/wolfson card, but in „Music Player Soundcard Settings“ i don’t find a right choice to select cirrus/wolfson card. I think that is necessary to add, step by step, all configurations needed to work cirrus/wolfons on your site. Please, give me a response asap. You can find the Cirrus Logic sound card in the Raspberry Settings. The selection is called „Wolfson Cirrus Logic (Kernelchange)“ and once it is saved and the device is rebooted, the sound card will appear as a selection in all audio players. My intention is to set up Kodi as my music server on my RPi 3 (since I like Yatse and in towk well with OpenHAB). I’ve installed VNC, but when I start Kodi in the M2P web interface, I do not see it starting on the Pi (in the video an Odroid is used). How can I access Kodi headless? I just need to configure remote control permissions etc. Second question is regarding the WiFi acces point plugin. Can I set the same SSID and password on several Pi’s to extend my network (the Pi’s will be connected via ethernet). Any advice would me much appreciated. Yes, this should be a viable option. You can use the access point setup to configure and control Max2Play’s features on the go and the Bluetooth plugin to pair your phone with an audio player for Spotify, etc. I need to work with M2P and the Firebase data base exists somehow …. Please detail your request and setup in our forums and I’ll be able to help you more directly. Is it possible to control LMS via Android BubbleUPnP? If the UPnP/DLNA interface plugin is active in your LMS, you can use it to play music to any players. However, for complete control of all of LMS‘ functions, you need to use the web interface or a Squeezebox app. Hi I have set up with shairport and can stream music from my apple device to my rasperry pi/hifiberry, I also have an android phone with Allcast but is doesn’t show up on the list. Should i be able to see it and stream from the android device also ? Hello, I use your software every day which is really excellent. I use a turntable (with touch screen and Digi + card), and another turntable (with Amp2 card). I am setting up all my multiroom, and therefore, multiply my decks (9 total). I would have liked to know if it was possible to CLONE the Sd card of my turntable (with amp2) to copy the 8 other cards to have in total my 9 identical turntables (Amp2) without reinstalling and setting up (just change the name and IP addresses). Sorry for my bad English, i’m french. Yes, you can create an .img file of your Max2Play system with our image burner plugin or you can use a simple software like WinDiskImager for that process. Also make sure your system can handle the load of 9 players in the same system. You might have to look at a different system than the Raspberry Pi for your server instance. In the future, please refer to our forums where we can get into detail on our system and have the whole community benefit from the exchange.